Every Christian has surely heard at least one message about infallible faith of Abraham. When an example of faith is needed, Abraham is on the top of the list. We all know the New Testament verses that say that "Abraham's faith was accounted as righteousness." Romans 4:9 "Does this blessedness then come upon the circumcised only, or upon the uncircumcised also? For we say that faith was accounted to Abraham for righteousness." This Galatians verse used by the Apostle Paul (and additionally by James) is actually a quote from the book of Genesis. Genesis 15:1-6 "After these things the word of the Lord came to Abram in a vision, saying, “Do not be afraid, Abram. I am your shield, your exceedingly great reward.” But Abram said, “Lord God, what will You give me, seeing I go childless, and the heir of my house is Eliezer of Damascus?” Then Abram said, “Look, You have given me no offspring; indeed one born in my house is my heir!” And behold, the word of the Lord came to him, saying, “This one shall not be your heir, but one who will come from your own body shall be your heir.” Then He brought him outside and said, “Look now toward heaven, and count the stars if you are able to number them.” And He said to him, “So shall your descendants be.” And he believed in the Lord, and He accounted it to him for righteousness."" As we read further, we notice that the Lord reminds Abram that He was the one who took him out of his land, from the mist of his relatives, from his father's house, from all that was familiar and his comfort zone, safety and protection. In spite of all that, Abram firmly trusted God and obeyed Him (Genesis 12:1-2). Doesn't God do that to us, too? When we are about to go through difficult situations that will test our faith, or before a major change, without which we cannot accomplish the wonderful plan that God has for our lives, the Holy Spirit reminds us some other important steps we have done by faith in the past. The life of faith is built "brick by brick." Abram had to leave the comfort and protection of well-known places where he lived until then to become "father of many nations," and his descendants to come to possess the promised land. Abram's life was a long series of promises, which he believed and were fulfilled, even if not all during his lifetime. Genesis 17:5-8 "No longer shall your name be called Abram, but your name shall be Abraham; for I have made you a father of many nations. I will make you exceedingly fruitful; and I will make nations of you, and kings shall come from you. And I will establish My covenant between Me and you and your descendants after you in their generations, for an everlasting covenant, to be God to you and your descendants after you. Also I give to you and your descendants after you the land in which you are a stranger, all the land of Canaan, as an everlasting possession; and I will be their God.”"
So, we can see that just like Abraham, for God's promises to be fulfilled, we need to do our share. God always does what depends on Him. God spoke to Abraham to go to the promised land, when he was 75 years old. 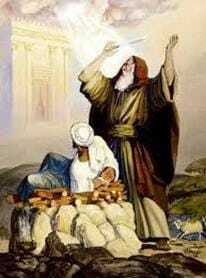 The Lord also told him that his new name will be Abraham, which means "father of multitude." Ten years passed, while Abraham and Sara waited faithfully for their promised son to be born. But the time did not yet come. What do we do when the Lord promises us something? We would like the prophecy to be fulfilled immediately! Some are more patient, others pass quickly from believing exactly what God has spoken to a mixture of thoughts with their own logic and some of what the Lord promised ... Abraham and Sarah have been patient for 10 years... but even for "the father of faith" it was too much. When Sara, a woman with practical way of thinking (or maybe not? ), came up with the idea of giving her husband the opportunity to procreate with her Egyptian slave, Hagar, deceiving herself that the children born by Hagar would be like hers ( as she was the owner of the beautiful young lady, right?) Abraham obeyed and he had nothing to say against it. It would have been so good if he had. Is it possible that the temptation of having a young handmaiden and a possible descendant in the process, even caused Abraham's faith to get off-course? Today we know that Ishmael, Abraham's son born of Hagar, is the father of the people who's future descendants would become the Muslims who have fought against Christians and Jews. If Abraham had continued to believe that Sarah would give birth to the son that God promised him, human history could have developed quite differently. I wonder how different our lives, as individuals would develop, if we would not doubt for a moment the Bible's promises or the prophetic words that God has given us over the years? I am afraid that there is no man who lives a life of faith by which to completely fulfill the perfect plan that God has prepared for him, except Jesus Christ incarnate. While it may seem easy to judge Abraham... it is not hard to realize how Abraham deserves to be called the father of faith. God does nothing by chance. If He decided that Abraham had to wait many years for his promised son to be born, He had His reasons. The oldest recorded mother is from India and she was 70 years old when she gave birth to her first child. She became a mother through artificial insemination. God delayed the fulfillment of the promise long enough, so no one could doubt the miracle. Isaac was a child given by God, as the fulfillment of the many promises He made to Abraham, over a period of 25 years! Abraham was to conceive a son at 99, by his wife who was 90 years old. Does it still seem so unnatural that Abraham started to doubt and laughed and then he tried to remind God that he already has Ishmael? God was firm on His promise and it part in the plan of salvation for humanity. Abraham's son, for God's plan, had to be the “son of promise” that was impossible to have without God's miracle and for the Son of God, the Messiah, Jesus Christ to later be born into this very blood line. This made a way for us, the Gentiles, to be adopted into God's people. From the beginning God said that from Isaac kings will be born (King Messiah and all leaders throughout history who have obeyed God). But, was it only Abraham who laughed when he heard again God's promise? For Abraham and Sarah, Isaac was a miracle beyond any doubt. The Lord knew that at that after 24 years, it was harder and harder for them to believe... but after He revisited them and reconfirmed the promise, their faith began to be rekindled. The fact that both are mentioned in the "Hall of Fame" of faith in the Epistle to Hebrews 11:8-14 and in the other references found in the Epistles of Paul and James, we might conclude that before the child is conceived, both already had firm faith that it will happen. Only firm faith will cause the promise to come to pass. What can we learn from Abraham's life of faith? We clearly see that even Abraham was not always 100% in all those years that he had to wait for the promise to come to pass. His merit was that he did not allow doubt to win and he even fought to strengthen his faith. Abraham's life serves as a reminder for the times when we get anxious for God's promises to be fulfilled according to our timing, how on the contrary, much time and patience can be required (most of the time), until we come to see the fruition of our faith. God agrees to negotiate with Abraham the cancellation of the destruction plan for the city of Sodom for fifty people,... to only 10. But there were not even 10 good men, in the city. We know that God listens to those who fear Him and live to please Him. When His children are praying, God hears and His mercy and goodness start to manifest in response to their prayers. It may be that Abraham's obedience to sacrifice his long awaited son of promise, is the greatest proof of faith and obedience ever manifested by a human being. God did not ask him, something He would not do Himself, He sacrificed His only begotten Son, Jesus Christ, too, for humanity. God had a close relationship with his friend Abraham, however, after some years, the Lord decided to test his faith. We know that their relationship was constant, because the Lord pronounced his name only once and Abraham replied: "Here I am"; he did not have to think twice, he recognized God's voice. Abraham was used to hearing God calling him by name, and even if it was at night, he answered urgently. The Bible records that he woke up "early in the morning" to fulfill what the Lord asked him. Abraham did not question what God had asked him to do, he did not postpone it nor did he complain, in fact, God began His request by canceling any argument that Abraham could use: "Then He said, “Take now your son, your only son Isaac, whom you love, and go to the land of Moriah, and offer him there as a burnt offering on one of the mountains of which I shall tell you” (Genesis 22:2). Don't we often feel the need to inform God of things, that we think He doesn't know, because if He knew them, He would not ask us to do this or that? What would the Lord do without us? God showed Abraham that He knows very well that Isaac is the only son, the very loved son and I dare say, that this was precisely the problem. Abraham was in danger of placing his son before the Lord in his heart and Abraham understood what the Lord was asking of him. He also knew how loving and great his God is. He had strong faith that "God will provide!" and he was obedient to Him to the end. Abraham, his servants and his son had to walk three days to the land of Moriah. Couldn't God find a closer place? I believe that it was necessary for Abraham to be given time for his faith to be tested. Isn't it that on the first day it is easier to believe that whatever the Lord tells us to do is good for us ... but as time goes by and we start to analyze things using our brilliant minds, we start to “waver." Our minds can find many sufficient reasons to doubt, and if this is not enough, the devil is more than willing to whisper plenty more... Abraham closed his ears to the devil's lies and did not allow him to interfere in the schedule God had for him. He did not delay his actions or change the route, he never commented, but followed the instructions of the Lord as received. The Bible does not say how old Isaac was, but if he could carry enough wood to burn his body on the altar, up the mountain, on his back, he could not be a small child. We do not read anywhere that Isaac opposed his father to placing him upon the altar. He knew very well the steps that had to be followed in order to bring a sacrifice on the altar. More than likely, it did not take Isaac long to realize that he was the sacrificial lamb and that probably helps us understand his lack of reaction. In those times, human sacrifices to the false gods were quite common, so it seemed easier to accept such an idea, than nowadays. Abraham had God's promise (and reaffirmed many times) that he would be the father of many nations, and he knew that Isaac was the son of promise, so it had to be hard to believe that God would allow harm or ask him to harm his son, maybe he wondered if God would raise him from the dead. The Lord had promised that all nations of the earth will be blessed in his "seed"... and now his "seed," his beloved and promised son was bound on the altar knowing that his own loving father is about to put an end to his life... I am sure that Isaac knew what God had promised to his father and what a miraculous birth he had. It looks like the son had faith that God would do something too because too, knew the faithfulness of God. So the son did not try to fight for his life. What intense and powerful emotions must have been in the hearts of the father and son! And suddenly, the Angel of the Lord, as named by Moses, the well-known voice of Jesus, called Abraham's name from heaven! Abraham answered quickly, as he was waiting and hoping to hear it, since the moment he received the sacrifice mission from His Lord! Lord called his name twice, to be sure the knife in Abraham's hand would not touch Isaac's chest. The Lord's voice continued by saying the words that Abraham was longing to hear! If Abraham would have not passed the test affirmatively, with unwavering faith, the promise given to him about his seed being a blessing for generations would not have come to pass. Why? Because the promise was followed by: "`To keep my covenant, you and your descendants after you throughout their generations' "
The fulfillment of God's promises in our lives depends on our level of faith and on living a life in obedience to Him and His commandments. How important is it for us to have faith? Abraham's faith was based on a very real and deeply sincere relationship with the living God. He trusted God with all his heart, all his life, his family, all wealth and servants. God's plan for Abraham included all his descendants, including all those that came to salvation through Jesus Christ, because Jesus came through the descendants of Abraham. Extreme measures were needed to test the faith of the chosen one to fulfill such promises. No wonder that all the generations that have followed Abraham saw him as a remarkable example. Abraham's name ("father of multitudes") is quoted over 230 times in the Bible. Even Jesus Christ talks high of Abraham, in front of the scribes, Pharisees and Sadducees. They were proud that they are the sons of Abraham, but they would not let the words of Jesus to enter in their hearts. Jesus tells them that if they had the faith of Abraham they would have a living relationship, but they preferred to replace God's law with the traditions and customs from the Talmud (the Law made by Pharisees, as explanation to how to apply the Torah - the Law given by God through Moses). Believing that Jesus is the Son of God who was sacrificed for the forgiveness of sins for each of us, comes only through the Holy Spirit in the human heart. 1 Corinthians 12:3 "Therefore I make known to you that no one speaking by the Spirit of God calls Jesus accursed, and no one can say that Jesus is Lord except by the Holy Spirit." How do we get and keep an unwavering, firm faith in the promises God gave us in the Bible and through the prophets? We study to know God's Word, the Bible and how it can be applied in our lives and we know that all God's promises and prophecies are confirmed with other Scripture, so we seek out the verses that apply to our situations. And we meditate on those verses daily, proclaim them out loud, asking the Holy Spirit to reveal their truth to our spirit, to understand everything the Lord has to say for us and through them. When the written or oral Word, "logos" becomes the revealed Word, "rhema" then the Word of God becomes alive and powerful in us, as we read in Hebrews 4:12. The Holy Spirit and God's Word have all the power needed to transform us and strengthen our faith if we will do our part! Oh, Lord please help us to learn and hear deep in our hearts, the truth of Your Word. Reveal to us the power and intent of Your Word; strengthen our faith. Transform, mold and shape us as only You can do.